Very few things can bring a mix to a halt more quickly than that grating resonance in the high mids cutting through a mix. This area is occupied by a lot of different instruments and can build to the point of a piercing boil in an otherwise great mix. 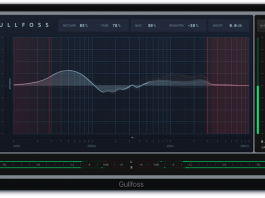 Mixing and mastering engineers use all sorts of tools to tame these areas in mixes, but what if you had an all-in-one solution with a few more tricks up its sleeve? 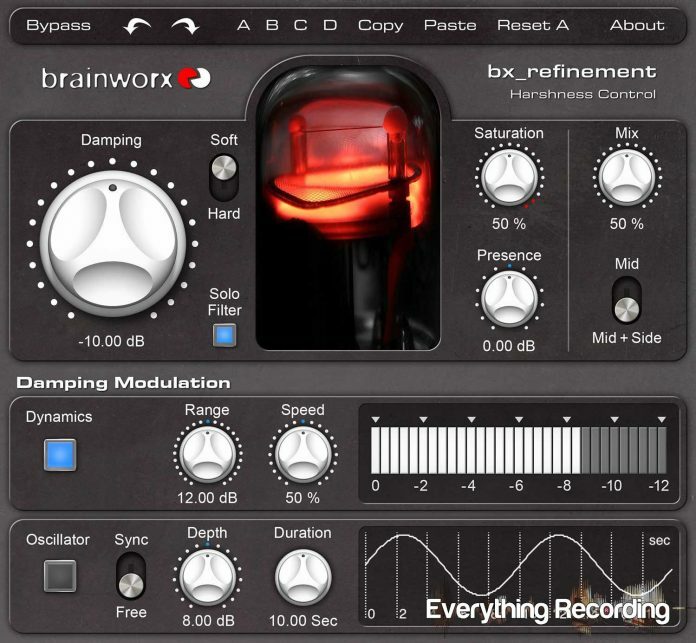 bx_Refinement is the latest offering from Brainworx and distributed worldwide by the Plugin Alliance. Borrowing from other features in their unique plugins, bx_Refinement gives you the tools you need to keep this high maintenance section in the mix at bay. 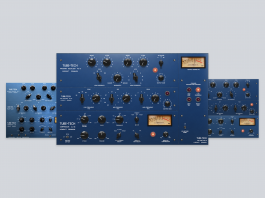 While Refinement can work on mono signals, this plugin shines the most on stereo signals, mainly the mix and master busses using mid-side processing to give separation and width to stereo tracks. Like everything though, the bounds can be tested to take the plugin to new applications. What you have is a very simple and sleek interface with controls that flow in a logical manner. Front and center, you get a great visual aid to display how much refinement you are using. This tube-like control glows in accordance to the signal being treated. To the left, the most important control stands out immediately on the interface, the Damping control. From here, your signal is treated with a very non-invasive peak band EQ that works within a set frequency range. 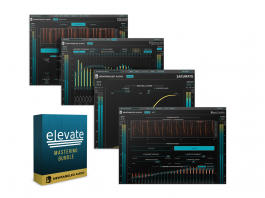 While at first, you may feel than not having a graphical representation and control over the frequency that is tamed; you will quickly see that this plugin works very well as an autopilot that can deal with almost every type of harsh signal. One of the great features of Refinement is the “Solo Filter” button that allows you just to hear the frequency that is being treated. Although soloing is not the best way to work within a mix, this is great for impromptu audible glances. Next to the “Damping” knob, you also are given a choice of “Soft” or “Hard” which alters just how broad or narrow you would like to process. Just below these controls lies the “Damping Modulation”, working in conjunction with the Damping control to add either a subtle or apparent compression to the frequencies that you have tamed with the Damping knob. These two features alone are worth their weight in gold and work very well to handle the high-mids that show up in today’s digital mixes; but Brainworx isn’t content stopping there. They have a knack for finding what you didn’t even know you wanted and placing in in one convenient plugin. 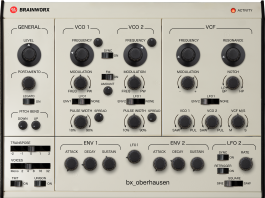 Refinement goes beyond just control and steps into sweetening by adding the saturation algorithm from their bx_saturator plugin, throwing in a little harmonic distortion to polish out the track and give it some depth. The Presence knob is available to bring back some of the life taken during the dampening stage by allowing a boost of the pleasing high frequencies to give a nice transparent sound without adding a metallic treble section. One way I used the Presence is to make the harshness stand out by boosting the trouble frequency with the dampening knob, mixing the presence to compete with the harshness, then dialing the dampening knob back. 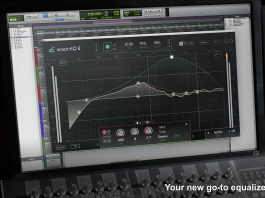 You could even take Refinement into a different area by cutting the dampening drastically and boosting this presence to add an Exciter like quality to the track. All of these features work brilliantly to handle even the toughest tracks or mixes and offer very unique approaches to dealing with this problem area. Ever wanted to breathe some life into keys in a song in an unorthodox way? Try using the Oscillator, which can either be rhythmically synced to the song or to free flow based on time. The Oscillator works as a subtle warm tremolo that can add a nice round groove to pads or just provide some movement in a rhythm guitar playing long chords. Combine this by just processing the sides of a stereo track and you’ve widened the signal on top of adding depth and movement to backing tracks that feel just a little dull. Since I found this trick, I’ve used it on almost every keyboard track in any song I’ve mixed whether it be subtle or in your face. The mix knob allows me to dial in just the amount of vibe to a track. These are functions I never probably would’ve even thought of chaining together using other plugins. Overall, I found bx_refinement a great plugin that works “behind the scenes” to solve a problem we all face. When using this plugin, I did find myself wanting a “range” knob that gave me a few choices of trouble frequencies but in most cases, Refinement did the job very well on its own. Other than that, this novel plugin works wonderfully to just take out what you do not want and leaving the rest unscathed and in some cases, enhanced. We all strive to bring back the analog life to our tracks while working in the box and bx_refinement is the best example of a plugin that tackles the woes of digital with style. 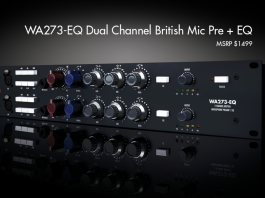 Every mix and mastering engineer needs this in their toolbox.